Are You Unknowingly Turning Prospects OFF? Salespeople are supposed to use words to fire-up prospects, but sometimes they backfire instead. In this episode of the Sales Management Minute, learn some common sales blunders. Years ago, I built a sales organization in the technology training industry. We advertised to make the phone ring for our salespeople. 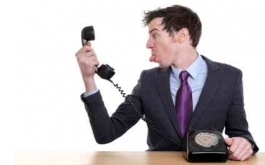 The only acceptable outcome from the inbound calls was scheduling appointments with prospects. That was the only acceptable outcome! Interestingly, we could draw a line down the middle separating those salespeople who did it tremendously well and those who failed miserably at it. When we listened to those who were effective, here’s what we heard. When we listened to those who struggled with appointment conversion, we heard a new word introduced. Same point of the conversation, here’s what we heard. What was the new word? Typically! What does “typically” mean? There are other ways! Imagine the prospect responses… “Can you fax, email, or send me the information?” As soon as we got typically out of their vernacular, they performed just like the others on the team. One word was the difference between success and failure. Several years ago, a large health club chain conducted a study on membership buying habits. The executives were amazed when they found that the decision to buy was made, not at the club, but rather before prospects set foot in the club. In essence, salespeople were talking people out of joining. It wasn’t their intent, but that was the result. Salespeople thought they needed to “sell” rather than take the order and, thus, created concerns for the prospects. What are you unknowingly saying to prospects that turns them off? Take a moment and consider the little tweaks and changes you can make to elevate your sales game.